I am so excited to be here and facilitate your child's education. Our goal is to prepare our students for careers beyond the classroom or for their next level of education. Because we are going to be partners in your child's education, I want to introduce myself. I am Tracey Arnold. I am married to Walter Arnold, Jr. I am the mother of three children Ashley, Anthony and Cameron. My greatest joy are my grandchildren, Ryann and Ashton. 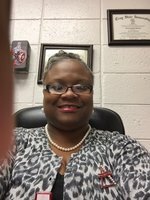 I am a member of Holly Springs Missionary Baptist Church and am also very active with First Missionary Baptist Church Youth Department. I enjoy community service and am active in the community through my sorority, Delta Sigma Theta Sorority, Inc. It is important to me that you feel welcome and trust that we are providing the best possible education for our students. Because of this I want to give you my word that since you are sending us the best and most important thing you have your child, we will treat them that way as well as with dignity and respect. Thank you for welcoming me into your family!